Japan plans to give an additional $200 million in “soft” loans to Cambodia early next year to be used to expand National Road 5 under the Southern Economic Corridor development framework, an official from the Japan International Cooperation Agency (JICA) said Thursday. Daisuke Fukuzawa, JICA’s Cambodia representative, said that a $15 million concessionary loan approved in 2013 is not enough to complete the project, which will expand a section of National Road 5 between Pursat province’s Krakor district and Kandal province’s Ponhea Leu district. “It is not enough so we need to add around $200 million more,” he said. 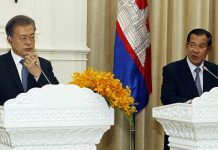 Cambodian and Japanese officials have already met to discuss the loan’s details and a formal final agreement will likely come early next year, according to Mr. Fukuzawa. “We already agreed with the government for the whole package and we have already discussed this issue…. If the government does not receive the loan, the project would be stuck,” he said. In March, Japanese Prime Minister Shinzo Abe announced a ¥19.2 billion (about $155 million) concessionary loan deal with Cambodia to fund the expansion of National Road 5 between Ban­teay Meanchey province’s Poipet and Serei Saophoan cities and between Battambang City and Pursat. Cambodia also received a $90 million loan from Japan in 2013 to improve the section of National Road 5 between Battambang City and Serei Saophoan City. Construction on that stretch of highway is set to begin early next year, Mr. Fuku­zawa said. Plans for National Highway 5 provided by Mr. Fukuzawa showed the expansion project would increase the road’s width from about 11 meters to 23 meters, and would add an additional lane in each direction. 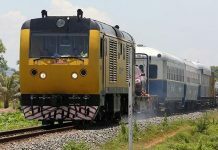 An official at the Ministry of Public Works and Transport, who requested anonymity because he was not authorized to speak to the media, said the expansion project from Pursat to Kandal could begin late next year if money was allocated. “I think that the construction would probably be able to start at the end of 2016…. Construction of roads needs money, but we don’t have money yet for construction,” the official said. John McGinley, managing partner of Mekong Strategic Partners, a Phnom Penh-based investment and advisory firm, said the continued development of National Road 5—part of the Southern Economic Corridor transportation route stretching between Ho Chi Minh City and Bangkok—would be a boost to Cambodia’s economic position in the region. “National Road 5 is a crucial transportation artery which runs direct through Cambodia’s agricultural heartland linking Phnom Penh and Thailand,” Mr. McGin­ley said in an email. Mr. McGinley added that Cambodia stood to benefit as Japan attempted to “de-risk and diversify” its automotive and electronics manufacturing supply chains from Thailand in the wake of severe flooding in that country in 2011 and a military coup in 2014. 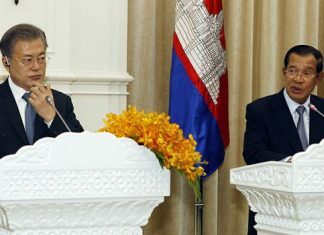 “Improvements in Cambodia’s road infrastructure and transportation links with Thailand will increase the attractiveness and likelihood of further Japanese investment into the higher end manufacturing sector, which offers Cambodian workers the opportunity for higher paying employment,” he said.